"The whole industry was viewing the Jeff Healey Band as an exceptional bar band." Jeff Healey didn't fit the Canadian music industry's image of a recording artist. Sure, there was the obvious reason why: Healey was blind, having lost his sight to ocular cancer has an infant. As a result, he learned to play the guitar by sitting it across his lap, positioned almost like a keyboard. But, according to the people who knew him best, that wasn't the major stumbling block for the industry. The problem was his hard-charging blues-rock style. "The whole industry was viewing the Jeff Healey Band as an exceptional bar band," says Jeff Healey Band bassist Joe Rockman. "We had struggles getting accepted in this country as a recording act." When they first met, Healey was just 19, and Rockman was immediately blown away by his talent, The pair immediately clicked. "I got the call for a sort of an ad hoc audition at Grossman's in Toronto," he says. "I was invited down to play a few songs. The chemistry was immediate between me and Jeff. I was pretty much astounded by what I heard." The Jeff Healey Band started touring heavily, and it didn't take long for them to develop a reputation for their dynamic live show. He'd even picked up an endorsement from blues rock legend Stevie Ray Vaughan. But in spite of that success, the group struggled to find a label who would sign them. "We were contacting every label that we could, the majors and the indies, and nobody really was interested enough to sign us," says Rockman. "Jeff did not fit into the mould of what a Canadian artist looked like, in a lot of senses," adds producer David Bendeth. "There was nobody like Jeff, there was no list of great Canadian blues guitar players. Jeff was really headstrong, too, he knew exactly what he wanted and he wasn't going to settle." In the end, it wound up being an American label that signed this unique Canadian talent. "I read the endorsements of Stevie Ray Vaughan, and so I booked a trip to Toronto and I went to see the Healey Band at a little club off Queen Street," says Mitchell Cohen, then an A&R with New York-based Arista records. "I was just, like, so knocked out. It was raw and blues-y. I made my A&R pitch to Clive Davis, the head of the label, and he got it instantly." The Jeff Healey band signed a five-album deal with Arista in 1988. In 1989, he'd release "Angel Eyes," which would be his most commercially successful single. "I didn't know what to make of it when I first heard the song," said Rockman. "Jeff did. Right out of the blue he perked up and said 'That's a top five hit,' and it was uncanny because he was exactly correct. That's exactly what it did in the United States. It went to top five on Billboard." Healey died of cancer in 2008. Rockman says that, in the years since his death, the Canadian industry has finally recognized Healey for the legend he was. 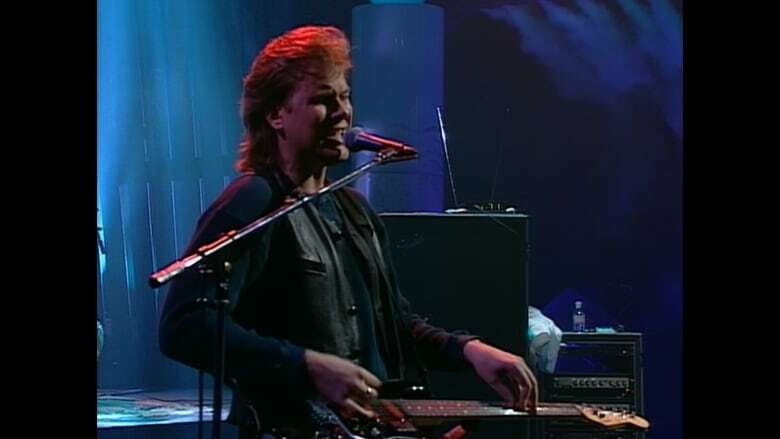 "I think that the music industry, later, especially after Jeff passed away, started to recognize just how much of a gem that this country had in Jeff Healey," he says.